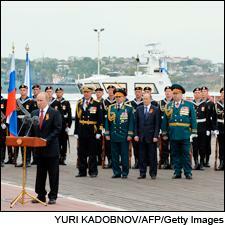 Russian President Vladimir Putin addresses sailors during a trip to Crimea. Will Paul Masson Be Banned in Moscow? Looking at today's news headlines you might think the Cold War is back. Not yet, but the current conflict in Ukraine and other disputes between the Russian Federation and the United States and its allies have certainly raised tensions. In response to Western economic sanctions, Russia announced in early August that it is banning imports of a long list of food items from the U.S., European Union and Australia. Wine is not on the list for now, but that may change—Russia has barred wines before, blocking imports from neighbor Georgia. Sanctions would be bad news for a growing number of American wineries that see potential in the Russian market. The value of U.S. wine exports to Russia almost doubled between 2012 and 2013, from $5.3 million to $11.1 million, according to the U.S. Department of Commerce. But unlike some other emerging markets, Russia presents special challenges—and not just politics. The country has been slow to develop a fine wine culture, and strict alcohol regulations, a risky business climate and a disposition toward inexpensive bulk wine over pricier luxury cuvées all pose obstacles. Of all U.S. wine export markets, Russia accounted for just 0.7 percent by value and 0.4 percent by volume in 2013. Overall wine sales have been unpredictable in Russia in recent years. From 2000 through 2007, sales rose from 52 million cases to 141 million cases, according to Impact Databank, with imports expanding nearly fourfold to 72 million cases. Since 2007, however, the market has shrunk by 25 million cases. In 2013, both imported wines and the total Russian wine market eked out nominal growth, advancing 1.6 percent to 55 million cases and 0.5 percent to 116 million cases, respectively, according to Impact, a sister publication of Wine Spectator. American wines made their way to Russia in the 1990s after the collapse of the Soviet Union. Paul Masson led the trend, arriving in 1993 and making the most of the post-Soviet thirst for American products and imported wine (Soviet wine was a largely industrial product). Being early on the market was essential to Paul Masson—and the brand remains the No. 1 American wine in Russia, selling 224,400 cases in 2013, according to Russian customs. “Paul Masson wines were the pioneers in the Californian wine category and are well-known to the Russian consumer," said Preston Mendenhall, spokesperson for Roust Inc., the distributor of the brand in Russia. "The other factors are good price-to-quality ratio, a convenient package design and bottle volumes of 1 liter and 3 liters.” Roust's strong distribution muscle also helps—it's a leading seller of both Russian vodka and foreign spirits like Rémy Martin. Since it first arrived in Russia in 2009, E&J Gallo’s Carlo Rossi has enjoyed strong sales gains, thanks largely to targeting a mostly younger, female audience. “It is the fastest-growing wine brand among U.S. wines and New World wines in Russia," said a spokesperson for E&J Gallo, a statement backed by customs figures. "Carlo Rossi is already the No. 3 New World wine brand here." Despite the big brands’ success, fine American wines have made their way into Russian stores and restaurants too. A growing number of Russians are not only fascinated by American culture but are able to travel to the U.S. and buy fine wines. Several prestigious labels have been on the market for some time already, including Paul Hobbs, Ridge, Opus One, Sine Qua Non, Kistler and Pahlmeyer. Bonny Doon wines have recently arrived. Most wine importers are looking for the ways to diversify their U.S. portfolios. But each import house is still figuring out how to sell these wines. Recent laws banning advertising of alcohol and limiting possibilities to conduct wine tastings has forced importers to get creative. Simple Group in Moscow targets the wealthiest clients and on-trade segment. Still, expensive wines are not exactly the fastest way to commercial success. “We are slowly evolving to the mid-priced wines and it will be extremely hard for us to compete in low-priced segment," said Maxim Kashirin, the CEO of Simple Group. "Bottles below $50 sell pretty well with clients being mostly premium restaurants. Wines like Lytton Springs are a big success." Distributor Fort Ltd. imports Harlan Estate, which sells for $1,300 per bottle in Moscow. “The higher segment is slowly developing, with people going frequently to the United States for business or leisure,” said CEO Maxim Lesnichenko. "The growing number of steak houses also calls for American wines." Luding, one of the biggest wine importers, already enjoys success with the value priced Gray Fox, a California wine brand for export markets owned by The Wine Group. Now Luding is diversifying its portfolio by adding high-end wineries with a special selection of fine wines called L-Wine. “U.S. wines are a part of our strategy," said Andrey Ushakov, head of the L-Wine project. “We have introduced six more producers to the portfolio this year," including PlumpJack Winery. But how do the U.S. wines appeal to the Russian palate? Many sommeliers and wine retailers believe American wines—especially fruity, powerful ones—appeal to Russian tastes. They think Russians would choose U.S. wines more often if they were not obsessed with the prestige of French and Italian wines. “We love friendly, fruity, bright tastes," said Christina Monkus, the marketing director for importer Eurowine. So American wines may have a bright future in the Russian market—if consumers get the chance to try them.